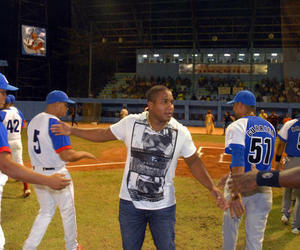 Alfredo Despaigne, the largest Cuban slugger, was greeted with applause and cheers from fans, family and teammates in the Martyrs of Barbados stadium in the city of Bayamo, Granma, after returning from his stay in Japan, where he played in the professional leagues. Despaigne played 45 games in the Chiba Lotte Marines of Japan, and ended with 311 averages, after turning 50 hits, including 12 home runs. Speaking to reporters, said he felt really good in the Land of the Rising Sun. On his return to the ranks of his team in Cuba explained that a few days rest before joining the group of Granma, now led by veteran Carlos Marti.